The aim of this study was to investigate the long-term outcome of hereditary tyrosinemia Type I (HTI) patients treated with 2-(2-nitro-4-trifluoromethylbenzoyl)-1,3-cyclohexanedione (NTBC) to increase knowledge about the clinical outcome in these patients. We want to mention that the patients with HTI have heterogeneous clinic. Early diagnosis and early treatment important to prevent the complications. Aretrospective study was carried out with twenty nine patients with HTI and who had been followed up by Ege University Faculty of Medicine, Department of Pediatric Metabolic Diseases and Nutrition Unit between December 1996 and September 2017. Eight patients were acute form, thirteen were subacute and eight patients were chronic form. Mean age onset of clinical symptoms was 3.7±1.6, 9±1.6 and 41±27 months in acute, subacute and chronic HTI patients, respectively. The mean interval from the first symptom the diagnosis was 12.2 months. Mean of follow-up was 82.2 months (minimum: 1 month-maximum: 203 months). Five patients of HTI diagnosed with hepatocellular carcinoma and neurogenic crises were detected in four patients. NTBC treatment is effective and improves the prognosis of HTI. But early diagnosis and treatment leads to much better outcome. Adherence to the diet and treatment and follow-up schedule of the patients are vital. Hereditary tyrosinemia Type I (HTI, OMIM 276700) is a rare inborn error of tyrosine metabolism due to deficiency of the enzyme fumarylacetoacetate hydrolase (FAH), the last enzyme in the tyrosine catabolic pathway (1) (Figure 1). Biochemically, patients typically have hypertyrosinemia and toxic metabolites. Toxic metabolites and their derivates such as fumarylacetoacetate (FAA), maleylacetoacetate, succynylacetoacetate (SA) and SA playa major role in tissue damage with hepatic, renal and neurological findings (2). The FAH gene is mapped in human chromosome 15q (15q23-25) and consists of 14 exons spanning over 35 kb of DNA. Up to now, approximately 100 mutations in the FAH gene have been associated with HTI and the mutations are listed in the Human Genome Mutation database (HGMD® Professional 2016.1, accessed on April 2016) (3,4). The clinic symptoms of hereditary HTI are numerous even within the same family members and can appear in any term extending from neonatal period to adulthood. Clinically, tyrosinemia Type I may be classified based on the age at the onset of symptoms, which broadly correlates with disease severity. The first form is an acute form that manifests before six months of age with acute liver failure but rarely in the first two weeks of life. The second form is a subacute form presenting between six months and one year of age with liver disease, failure to thrive, coagulopathy, hepatosplenomegaly, rickets and hypotonia. The last form is a chronic form that presents after the 1st year with chronic liver disease, renal disease, rickets, cardiomyopathy and/or a porphyria-like syndrome (1,5). Porphrya-like syndrome, in other words neurogenic crises, is usually precipitated by intercurrent infection or interruption of 2-(2-nitro-4-trifluoromethylbenzoyl)-1,3-cyclohexanedione NTBC. The crises, which may be severe, are characterised initially by pain (including abdominal pain mimicking an acute surgical emergency), weakness and autonomic changes such as hypertension and hyponatremia. Patients may develop an acute progressive ascending motor neuropathy and convulsion. There is a hepatocellular carcinoma (HCC) development risk (1). Other clinical manifestations that less frequently observed are hypoglycemia due to hyperinsulinism (6) and hypertrophic cardiomyopathy (7,8). For the diagnosis, SA is the most useful test that may be measured in urine, plasma and dried blood spot. Even though, very rarely, urine SA elevation may be absent in mild cases (9). Newborn screening with SA from dried blood spots has been established in some countries. In this manner, the treatment to be started before the development of clinical symptoms improves the prognosis of disease (10,11). Mutation analysis of FAH gene provides confirmation of the diagnosis and antenatal diagnosis (12). The phenylalanine and tyrosine restricted diet and nitisinone NTBC are base in the treatment of HTI. There are two aims in treatment of HTI; diet is for reduction of tyrosine levels and NTBC is for inhibition of formation of toxic metabolites (1,13). 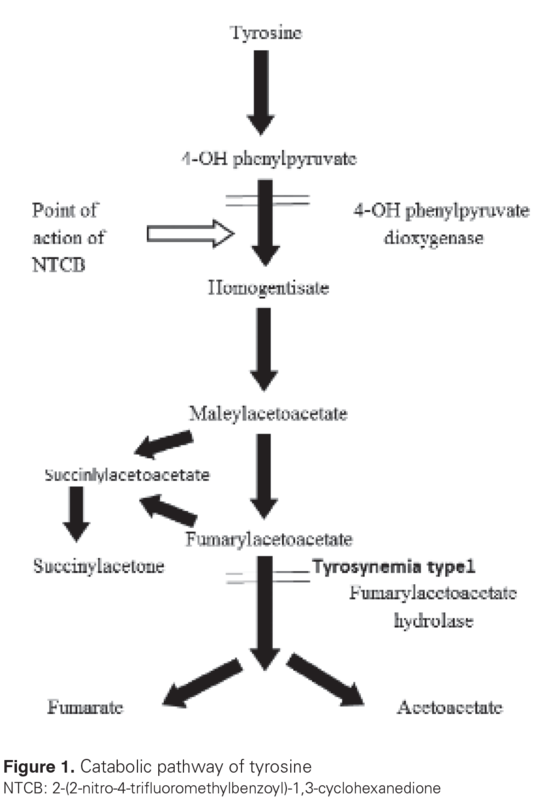 Point action of NTBC is the second step of tyrosine catabolic pathway by inhibiting 4-hydroxyphenylpyruvate dioxygenase (14) (Figure 1). It is important to commence nitisinone at an early period and comply with the follow-up and treatment. 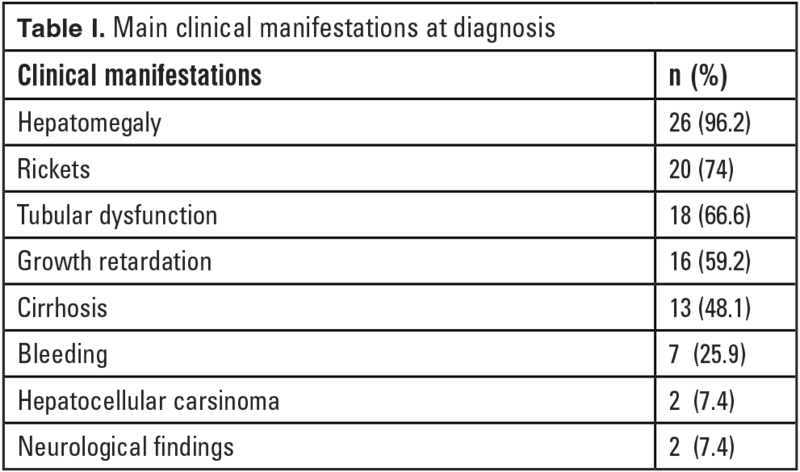 HCC development risk has reduced since nitisinone came into use (15). The aim of this study was to investigate the long-term outcome of HTI patients treated with NTBC to increase knowledge about the clinical outcome in these patients. We want to mention that the patients with HTI have heterogeneous clinic. Early diagnosis and early treatment are substantial to prevent the complications. A retrospective study was carried out by twenty nine patients with HTI from twenty three families and who had been followed up by Ege University Faculty of Medicine, Department of Pediatric, Division of Metabolic Diseases and Nutrition Unit, between December 1996 and September 2017. The data of patients including demographic, clinical, biochemical, radiological and mutation analyses were collected from the medical records. Diagnosis of HTI was carried out by detection of elevated SA in urine samples or by molecular genetic analysis or by enzymatic studies. None of the patients were screened at birth for HTI. Except three patients, all of the patients were treated with tyrosine and phenylalanine restricted diet to maintain plasma level below 400 µmol/L as recommended and treated with NTBC at 1-2 mg/kg. Informed constent was obtained. The quantitative patient characteristics such as age, onset of clinical symptoms were summarized by means and standard deviations (SD). The qualitative characteristics such as hepathomegaly, growth retardation and other organ complications were presented as a frequency distribution. We collected data from twenty nine patients from twenty six families diagnosed at Ege University Faculty of Medicine, Department of Pediatric, Division of Metabolic Diseases and Nutrition Units. Aged between one month and one hundred forty months at the time of the diagnosis. Sixteen were males and thirteen were females. There were 29 HTI patients from 23 different families and consanguinity was noted in 14/23 (60.8%) of our patients’ families. There were eleven patients in this study who belonged to five sets of families. Eight were of acute form, thirteen were of subacute and eight were of chronic form of HTI. None of the patients were screened by expanded newborn screening for HTI. Two patients were diagnosed with HTI without symptom by selective screening due to affected siblings. First patient (P3S) was diagnosed by selective screening in the newborn period due to an affected sibling history and she was asymptomatic at the diagnosis. We have another asymptomatic patient (P14S) at the time of diagnosis. He was diagnosed with HTI by selective screening while two months old, his brother was also diagnosed with HTI. Mean age onset of clinical symptoms was 3.7±1.6, 9±1.6 and 41±27 months in acute, subacute and chronic HTI patients, respectively. The most common clinical manifestation at the diagnosis was hepatomegaly (96.2%). The other manifestations were respectively rickets, renal tubular dysfunction, growth retardation (Table I). Hypoglycemia was detected in none of our patients. 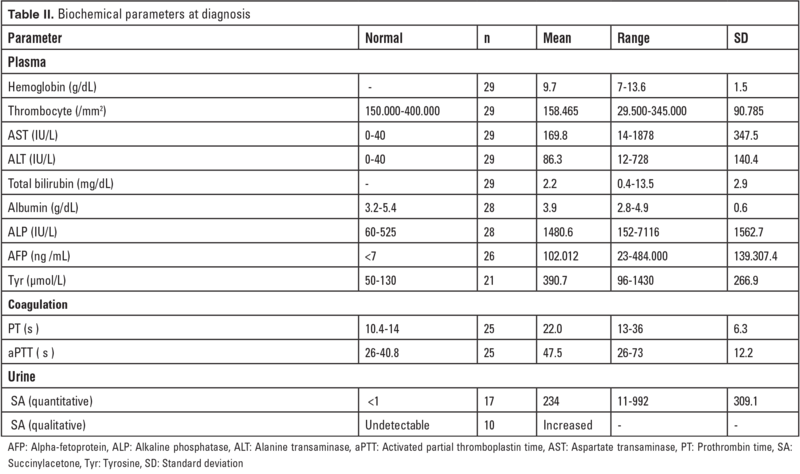 Anemia was detected in 24 patients and thrombocytopenia was detected in 15 patients at diagnosis (Table II). Renal tubulopathy was detected in 18 patients. Rickets was detected in 20 patients clinically, radiologically or biochemically. Alpha-fetoprotein (AFP) showed a marked increase with a high variability for all ages. Urine SA was detected quantitative in seventeen patients and qualitative in 10 patients. Abdominal ultrasonography showed hepatomegaly in twenty seven patients and liver nodules in twenty patients. Abnormal renal imaging findings include increased renal echogenity; nephromegaly or nephrocalcinosis was seen in sixteen patients. There was no cardiomyopathy in nineteen patients with initial echocardiography. Except three patients, all of the patients were treated with tyrosine and phenylalanine restricted diet to maintain plasma level below 400 µmol/L as recommended and treated with NTBC at 1-2 mg/kg. P17 was not treated, because family rejected the treatment. P27 was not treated, because he died within a short time after diagnosis. P29 was not treated, because she came with severe liver failure and liver was transplanted under emergency condition. Dietary compliance and NTBC treatment compliance were bad in six patients due to incompatibility of families. Mean follow-up was 82.2 months (minimum: 1 month-maximum: 203 months). In follow up, regular abdominal USG was performed every 6-12 months and AFP levels, plasma amino acids and urine succinylacetone were checked every 3 months. Mayorandan et al. (16) recommended follow-up with ultrasonography (USG) of the liver every 6 months and monitoring of AFP levels every 3-6 months. Eleven patients (P3, P5C, P6, P9, P11, P13, P15, P18, P19, P22, P23) underwent liver transplantation, all living donor transplantations (Table III). After liver transplantation, one patient (P23) died due to hepatorenal syndrome. Porphrya-like crises, in other words neurogenic crises, were detected in four patients (P1S, P2C, P7, P10) by reason of non-compliance with the dietary treatment and NTBC treatment. HCC was detected in five patients (P1S, P2, P8, P12, P17). Two of these patients had HCC at the time of the diagnosis HTI. Two patients who developed HCC during the follow up of HTI were non-compliant with the dietary treatment and NTBC treatment. No adverse effect was seen requiring nitisinone treatment todiscontinue. HTI has a birth incidence approximately 1:125.000 in central Europe. Turkey has a high estimated prevalence of inborn errors of metabolism due to a high rate of consanguineous marriages (17,18). The exact incidence of HTI in Turkey is still unknown. We have 29 HTI patients from 23 different families and consanguinity was noted in 14/23 (60.8%) of our patients’ families. This is similar to the other studies of HTI reported from the Turkey (19,20). In Turkey HTI is not a part of national neonatal screening program, so diagnosis still depends on clinical suspicion and laboratory investigations. Two of our patients were diagnosed by selective newborn screening due to an affected sibling and they were asymptomatic at time of the diagnosis. The most common manifestations were respectively hepatomegaly, rickets, renal tubular dysfunction, growth retardation in our patients at the diagnosis. In our study, the first signs were detected after six months of age (19/27) in contrast with report of Couce et al. (21). Also growth retardation was detected at more high ratio (59.2%) in contrast with report of Gokay et al. (19) and Zeybek et al. (20). The mean interval from the first symptom of the diagnosis was 12.2 months. Initial symptoms might have been overlooked by the parents or clinicians especially in the chronic form of HTI. The most remarkable laboratory findings were anemia, elevation of liver enzymes with impairment of the coagulation profile, elevated alkaline phosphatase, AFP and plasma tyrosinelevels. In acute HTI patients, laboratory findings were associated with more severe consistent previous reports (19-21). Urine SA ratio (93.1%) was higher in the report of Gokay et al. (19) and Zeybek et al. (20). Treatment can be started in patients who have response to drug treatment with normalization in serum AFP levels within the first year of therapy. As known, development of HCC is the main risk for patients with the chronic form or who have been treated with NTBC after 2 years of age (22,23). Also, the detection of liver cancer is imperfect and laborious. Two of our patients with HCC were treated with NTBC after 2 years of age. Non-compliance with the NTBC treatment resulted HCC in two patients. Another important point is that permanent interruption of NTBC treatment resulted neurogenic crises in four patients. Önenli Mungan et al. (24) and Schlump et al. (25) reported that interruption of nitisinone treatmentcan cause severe neurological crisis inpatients with HTI. These crises occur in up to 50% of untreated children and these are one of the major causes of mortality (5,26). In follow up, regular abdominal USG was performed every 6-12 months and AFP levels, plasma amino acids and urine succinylacetone were checked every 3 months. Chinsky et al. (27) recommended follow-up with USG or computed tomography or magnetic resonance imaging of the liver yearly and monitoring of AFP levels every 3-6 months. Liver enzymes and coagulation parameters normalized about 1 week later with diet and nitisinone treatment in all symptomatic patients. Elevated AFP levels of patients who were under medical treatment with NTBC decreased continuously throughout the first year of the treatment. The results of NTBC and diet treatment are consistent with the literature (27). Eleven patients underwent liver transplantation, all living donor transplantations (Table III). Acute liver failure or malignancy are the symptoms of liver transplantation. If the advised medical treatment with nitisinone is not attached to or is not present, the patient is under the risk of acute and chronic complications of HTI. Therefore they may be taken into account for liver transplantation in accordance with the classical criteria determined before the availability of nitisinone. In our study three patients underwent liver transplantation because the families stated that they had a difficulty in adapting medical treatment. Considering this period that can cause a vital hazard patients, liver transplantation request of the families resulted positively. These three patients are still alive. Limitations of present study are that the plasma level of nitisinone was not measured and molecular analysis of the patients were not taken into consideration. NTBC treatment is effective and improves the prognosis of HTI. However, early diagnosis and treatment lead to much better outcome. HCC incidence is low if treatment can be started in newborn period. So, screening for HTI in newborns is very important. Our study showed once again that adherence to the diet and treatment and follow-up schedule of the patients are vital. Informed Consent: Informed constent was obtained. Surgical and Medical Practices: H.Y., E.E., E.C., S.H.,Concept: H.Y., M.Ç.,Design: H.Y., S.K.U., Data Collection or Processing: H.Y.,Analysis or Interpretation: H.Y.,Literature Search: H.Y.,Writing: H.Y. 1. Chakrapani A, Gissen P, McKierrnan P. (2016) Disorders of tyrosine metabolism. In: Saudubray JM, van den Berghe G, Walter JH (eds) Inborn metabolic diseases, diagnosis and treatment, 6th edn. Springer, Heidelgerg, pp 265-76. 2. McKiernan PJ, Preece MA, Chakrapani A. Outcome of children with hereditary tyrosinaemia following newborn screening. Arch Dis Child 2015;10:738-41. 3. Angileri F, Bergeron A, Morrow G, et al. Geographical and ethnic distribution of mutations of the fumarylacetoacetate hydrolase gene in hereditary tyrosinemia type 1. JIMD Rep 2015;19:43-58. 4. Morrow G, Angileri F, Tanguay RM.Molecular Aspects of the FAH Mutations Involved in HT1 Disease.Adv Exp Med Biol 2017;959:25-48. 5. van Spronsen FJ, Thomasse Y, Smit GP, et al. Hereditary tyrosinemia type I: a new clinical classification with difference in prognosis on dietary treatment. Hepatology 1994;20:1187-91. 6. Baumann U, Preece MA, Green A, Kelly DA, McKiernan PJ.Hyperinsulinism in tyrosinemia type 1. J Inherit Metab Dis 2005;28:131-5. 7. Arora N, Stumper O, Wright J, Kelly DA, McKiernan PJ.Cardiomyopathy in tyrosinaemia type I is common but usually benign. J Inherit Metab Dis 2006;29:54-7. 8. Mohamed S, Kambal MA, Al Jurayyan NA, et al. Tyrosinemia type 1: a rare and forgotten cause of reversible hypertrophic cardiomyopathy in infancy. BMC Res Notes 2013;6:362. 9. Cassiman D, Zeevaert R, Holme E, Kvittingen EA, Jaeken J. A novel mutation causing mild, atypical fumarylacetoacetase deficiency (Tyrosinemia type I): a case report. Orphanet J Rare Dis2009;4:28. 10. Larochelle J, Alvarez F, Bussières JF, et al. Effect of nitisinone (NTBC) treatment on the clinical course of hepatorenal tyrosinemia in Québec. Mol Genet Metab 2012;107:49-54. 11. Mckiernan PJ. Nitisinone in the treatment of hereditary tyrosinemia type 1. Drugs 2006;66:743-50. 12. Morrow G, Angileri F, Tanguay RM. Molecular Aspects of the FAH Mutations Involved in HT1 Disease. Adv Exp Med Biol 2017;959:25-48. 13. Holme E, Mitchell G. (2014) Tyrosine metabolism. In: Blau N, Duran M, Gibson KM, Dionisi-Vici C (eds) Physician’s Guide to the Diagnosis,Treatment, and Follow-Up of Inherited Metabolic Diseases, Springer, Heidelberg, New York, Dordrecht, London, pp 24-31. 14. Lindstedt S, Holme E, Lock EA, Hjalmarson O, Strandvik B.Treatment of hereditary tyrosinaemia type I by inhibition of 4-hydroxyphenylpyruvate dioxygenase. Lancet 1992;340:813-7. 15. Das AM. Clinical utility of nitisinone for the treatment of hereditary tyrosinemia type-1 (HT-1). Appl Clin Genet 2017;10:43-8. 16. Mayorandan S, Meyer U, Gokcay G et al. Cross-sectional study of 168 patients with hepatorenal tyrosinaemia and implications for clinical practice. Orphanet J Rare Dis 2014;9:107. 17. Ozalp I, Coskun T, Tokol S, et al. Inherited metabolic disorders in Turkey. J Inherit Metab Dis 1990;13:732-8. 18. Tuncbilek E, Ozguc M. Application of medical genetics in Turkey. Turk J Pediatr 2007;49:353-9. 19. Gokay S, Ustkoyuncu PS, Kardas F, Kendirci M. The outcome of seven patients with hereditary tyrosinemia type 1. J Pediatr Endocrinol Metab 2016;29:1151-7. 20. Zeybek AC, Kiykim E, Soyucen E, et al. Hereditary tyrosinemia type 1 in Turkey: twenty year singlecenter experience. Pediatr Int 2015;57:281-9. 21. Couce ML, Dalmau J, del Toro M, Pintos-Morell G, Aldamiz-Echevarría L; Spanish Working Group on Tyrosinemia type 1.Tyrosinemia type 1 in Spain: mutational analysis, treatment and long-term outcome. Pediatr Int 2011;53:985-9. 22. Holme E, Lindstedt S. Nontransplant treatment of tyrosinemia. Clin Liver Dis 2000;4:805-14. 23. Van Spronsen FJ, Bijleveld CM, Van Maldegem BT, et al. Hepatocellular carcinoma in hereditary tyrosinemia type I despite 2-(2nitro-4-3-trifluoromethylbenzoyl)- 1,3-cyclohexanedione treatment. J Pediatr Gastroenterol Nutr 2005;40:90,3. 24. Önenli Mungan N, Yıldızdaş D, Kör D, et al. Tyrosinemia type 1 and irreversible neurologic crisis after one month discontinuation of nitisone.Metab Brain Dis 2016;31:1181-3. 25. Schlump JU, Perot C, Ketteler K, et al. Severe neurological crisis in a patient with hereditary tyrosinaemia type I after interruption of NTBC treatment. J Inherit Metab Dis 2008;31 Suppl 2:S223-5. 27. Chinsky JM, Singh R, Ficicioglu C, et al. Diagnosis and treatment of tyrosinemia type I: a US and Canadian consensus group review and recommendations. Genet Med 2017;19.